Memory & Justice: British Psychological Society: Memory and the law. British Psychological Society: Memory and the law. A very significant document was released last year by the British Psychological Society. 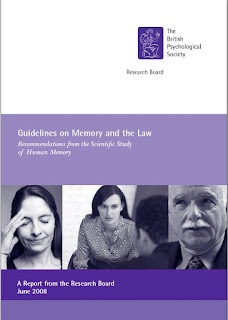 It is called Guidelines on Memory and the Law – recommendations from the Scientific Study of Human Memory. According to the introduction, its purpose is to: "provide those involved in legal work (criminal and civil) with an accessible and scientifically accurate basis from which to consider issues relating to memory as these arise in legal settings". i.) Memories are records of people’s experiences of events and are not a record of the events themselves. In this respect, they are unlike other recording media such as videos or audio recordings, to which they should not be compared. ii.) Memory is not only of experienced events but it is also of the knowledge of a person’s life, i.e. schools, occupations, holidays, friends, homes, achievements, failures, etc. As a general rule memory is more likely to be accurate when it is of the knowledge of a person’s life than when it is of specific experienced events. iii.) Remembering is a constructive process. Memories are mental constructions that bring together different types of knowledge in an act of remembering. As a consequence, memory is prone to error and is easily influenced by the recall environment, including police interviews and cross-examination in court. iv.) Memories for experienced events are always incomplete. Memories are time-compressed fragmentary records of experience. Any account of a memory will feature forgotten details and gaps, and this must not be taken as any sort of indicator of accuracy. Accounts of memories that do not feature forgetting and gaps are highly unusual. v.) Memories typically contain only a few highly specific details. Detailed recollection of the specific time and date of experiences is normally poor, as is highly specific information such as the precise recall of spoken conversations. As a general rule, a high degree of very specific detail in a long-term memory is unusual. vi.) Recall of a single or several highly specific details does not guarantee that a memory is accurate or even that it actually occurred. In general, the only way to establish the truth of a memory is with independent corroborating evidence. vii.) The content of memories arises from an individual’s comprehension of an experience, both conscious and non-conscious. This content can be further modified and changed by subsequent recall. viii.) People can remember events that they have not in reality experienced. This does not necessarily entail deliberate deception. For example, an event that was imagined, was a blend of a number of different events, or that makes personal sense for some other reason, can come to be genuinely experienced as a memory, (these are often referred to as ‘confabulations’). ix.) Memories for traumatic experiences, childhood events, interview and identification practices, memory in younger children and older adults and other vulnerable groups all have special features. These are features that are unlikely to be commonly known by a non-expert, but about which an appropriate memory expert will be able to advise a court. x.) A memory expert is a person who is recognised by the memory research community to be a memory researcher. It is recommended that, in addition to current requirements, those acting as memory expert witnesses be required to submit their full curriculum vitae to the court as evidence of their expertise.